Call, email, or text for a quote. Please include pick-up and drop-off addresses, and I'll quickly get back to you with a price. 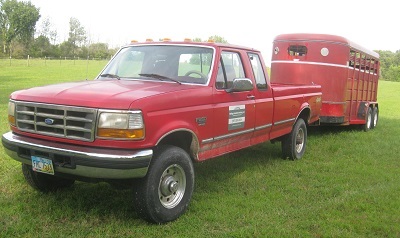 I use a 16' bumper-pull livestock trailer. Payment is due in cash* (I also accept PayPal) at time of drop-off unless other arrangements have been made prior to pick-up date. Please let me know if you need a receipt. I carry $10,000 in cargo insurance. If your livestock is going to cross state lines, it is your responsibility to obtain any health papers or entry permits necessary for interstate travel. If you don't have the correct paperwork, I won't haul your animals. This website is a good resource explaining requirements for traditional livestock. I will do my best to get your livestock on the trailer; however, in the unlikely event that we are unable to load your animals, I'll charge enough to cover my fuel for the trip. If you have any concerns about getting your livestock loaded, let me know so I can enlist additional help or bring extra equipment (e.g., gates) with me. I want to make sure everything goes smoothly, please provide any information that might help. The more information I have prior to pickup, the better. *My use of cash is not intended to avoid paying income tax, I report all earnings appropriately. I just want to avoid ending up with an empty trailer and a bad check at the end of the day.